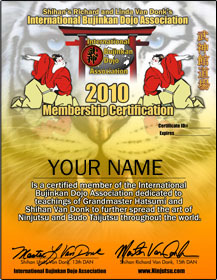 "TAKING YOU FROM BEGINNER TO MASTER"
IBDA MEMBERSHIP HAS NEVER BEEN MORE EXCITING OR REWARDING!! THE SECRETS OF THE NINJA CAN BE YOURS FOR ABOUT .11 CENTS A DAY!! Learn Ninjutsu 24 hrs a Day! THE NINJA VAULT – ONLINE STUDY GROUP – PRIVATE FORUM – MEMBERSHIP CERTIFICATE – IBDA PATCH – WEEKLY TEACHINGS – FREE STUFF – AND MUCH MORE!! !